Users may not be seeing all of their Fiscal Year Fund Balance type funds (like PI Overhead & Department Discretionary) in Summit. If the fund has not had any activity in FY15, the fund will not be listed on the summary page in Summit. Once theinitial close ofFY14 isdone on Friday, July 18th, theFY14 ending balances will be carried forward as theFY15 beginning fund balances and users will see all of their Fiscal Year Fund Balance type funds in Summit. If a user’s fund has had activity in July, the fund will be listed on the summary page in Summit, but the beginning fund balance will be 0.00 until the initial close of FY14 is done on Friday, July 18th. If the user changes the ‘Through Fiscal Period’ back to 2014-12 (Jun, 2014), the user will see all of their Fiscal Year Fund Balance type funds and the ending balance at June 30, 2014. If you have any questions, please contact Maura Shield at x43515 or PI’s may want to contact his/her Financial Administrator. Bring your old WB Mason catalog to trade in for an OfficeMax catalog. There will be coffee and pastries and a chance to win an OfficeMax gift basket! Please remember that today Friday May 9th will be the last day to place WB Mason orders. We hope to see you this Morning. As we prepare for the end of the fiscal year, we ask your assistance in ensuring an orderlyfinancial closing process. The following memorandum provides important information andcut-off dates to be followed. While many administrators may be familiar with the pastclosing process, we ask all administrators to review the information below as someinformation has changed for this year. The memorandum is divided into 3 sections: 1) Administrative Oversight 2) Cut-off Datesfor Campus Transactions, and 3) Training and Assistance. Procurement Services will hold information sessions on year-end procedures onWednesday, May 28th at 1:00 p.m. Cumnock Hall, Trustees Room; and on Tuesday, June 3rdat 9:30 a.m. in the Health and Human Sciences Building, Room 150. These sessions will also be broadcast live via GoToMeeting web conferencing. Please register two days in advance for these web sessions so we may send you the log-in information. For additional procurement information, demonstrations, and training sessions, please visit the Procurement Services website. Please take a moment to review the following information and understand the impact onyour budget and area of your responsibility. We hope this information is helpful andappreciate your feedback concerning the year-end process and training programs. Comments may be addressed to the Controller’s Office. Read the full FY 14 Year End Close Memorandum with dates and deadlines here. Thank you for your assistance to ensure a successful closing. 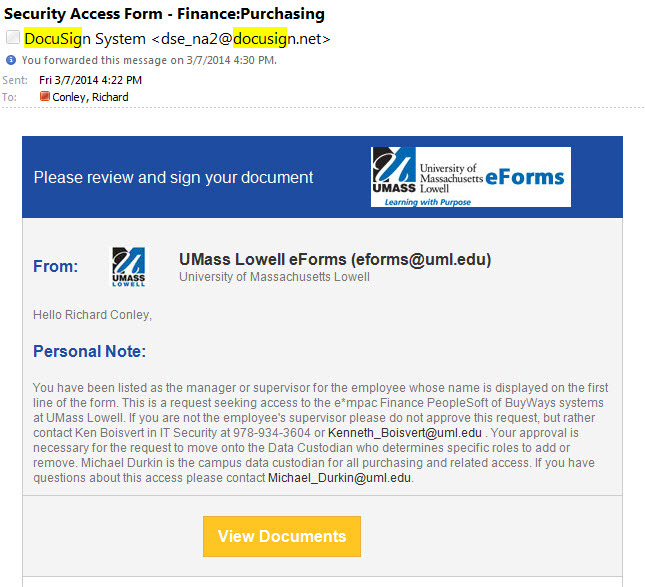 UMass Lowell is now using DocuSign as an electronic signature tool within the Access Request Process for the Finance System. This is intended to improve campus compliance with security access policies while doing so without the need for paper to shuffle from office-to-office. As part of new procedures, all managers/supervisors must sign-off on access requests for any of their employees. The campus data custodians for each functional area will authorize the specific security roles and the Information Technology office will update the security settings once all approvals have been collected. If you have any questions about this new process please email eforms@uml.edu . The Summit Financials update was successfully completed on Friday 3/14/14. If you have any display issues the rule of thumb is to clear browser cache and history. If you continue to have issues, please contact Norma_Clark@uml.edu. The Summit Finance System will be unavailable this Friday, 3/14/14, as a patch set is being applied to the Summit tool. One enhancement that users will notice immediately is the ‘bread crumbing‘ at the bottom of each Summit page. Users will now be able to see how they navigated to a particular page of a dashboard. (For example, FDM: Department Admin: Summary > FDM: Department Admin: Budget Balance Activity > Budget Balance ‘ Expense Summary ‘ All Accounts) While users can still use the ‘return’ link to go back to the previous page, users will also be able to use the ‘bread crumbing’ to return to a previous dashboard page. Purchasing, working in conjunction with the UMass System Office and other campuses, is pleased to announce a new travel initiative that will provide new resources to the UMass Lowell community for their travel needs. These new resources will include an online booking tool and a traditional travel agency to assist with your travel bookings in the future. The online booking tool known as Egencia is the corporate arm of Expedia.com and will be recommended for basic domestic travel bookings. The traditional agency known as the Travel Collaborative will bring a high level of service to international travelers and some of the more complex domestic trips. All of this will be accessible from the catalog section of BuyWays or the Procurement web page. Fall Semester 2013 Effort Certification and Reporting Technology (ECRT) certification period (August 25,2013 – Jan. 18,2014) opens up on March 4, 2014. Certifications must be completed by March 14, 2014. Your user name and password is the same as the campus account name you use to login to your UMass Lowell email and/or work computer. To complete your certifications, you may go to theE*MPAC webpageand log into ECRT. Please be sure to certify your current and any past due cards in the system. If you have any issues logging into the system please contact the ECRT Central Administrator Nancy Desjardins, in the Office of Research Administration at 978-934-4719. All other questions should be directed to your Effort Coordinator, Suzanne Mahoney at 978-934-4726, Kevin Mascoll at 978-934-3646 or Danielle DeLuca at 978-934-3462. Over the next few months there will be several exciting new updates and changes coming to the UMass BuyWays system that include a new user interface, a change in office supply vendor and a new travel services program. The initial update will be in the form of a new User Interface (UI) called Phoenix. The new UI will automatically be applied at the end of the work day on January 31st. While the change is mainly meant to streamline the ‘look & feel’ verses functionality, Purchasing will be holding several informational sessions over the next week to review this new look and feel. The first of these sessions is scheduled for tomorrow, Thursday, in Southwick 240. Please register for this or any session at https://www.applyweb.com/public/register?s=25L027YU . Purchasing will also continue to offer general drop-in support every Wednesday and Thursday from 3 ‘ 4 p.m. in our offices on the 4th floor of Wannalancit. We recommend BuyWays User’s take a few minutes to familiarize themselves with the new UI. We have added two new job aids to the E*MPAC Job Aids & Training pages (http://www.uml.edu/Admin/empac/Information-for/BuyWays.aspx) in order to help you make the transition to new UI called Phoenix. The first job aid, ‘Phoenix – Switching the User Interface’, shows you how to switch your user interface to Phoenix from the current ‘Classic’ UI. The second job aid, ‘Phoenix ‘ Navigation Job Aid’, shows you where to find and access items within Phoenix. Purchasing, working in conjunction with the other UMass Campuses, has recently awarded the University wide office supply contract to OfficeMax. This decision was made after careful consideration of bids submitted by 4 major office supply companies, including our current supplier WB Mason. OfficeMax provided the best overall bid to the University that includes an estimated savings of 1.2 million dollars per year, excellent customer service plan and internships for UMass students. We expect the transition from our current provider to OfficeMax to be virtually seamless but ask for your cooperation and understanding as we make the transition. The exact date of transition has not yet been set but is expected to be sometime around the end of February or beginning of March. There will be more information to follow on this subject and an opportunity to come out to meet the team from OfficeMax over the next several weeks. Purchasing, working in conjunction with the UMass System Office and other campuses, is pleased to announce a new travel initiative that will provide new resources to the UMass Lowell community for their travel needs. These new resources will include an online booking tool and a traditional travel agency to assist with your travel bookings in the future. The online booking tool is known as Egencia, which is the corporate arm of Expedia.com and will be recommended for basic domestic travel bookings. The traditional agency is known as the Travel Collaborative, which will bring a high level of service to international travelers and some of the more complex domestic trips. All of this will be accessible from the catalog section of BuyWays or the Procurement web page. We expect to formally announce this exciting new program during the month of February and will be offering demonstrations, training and an opportunity to meet the teams from each of these new travel providers. Please keep an eye out for a more formal announcement and schedule of events over the next month. Please call the Purchasing Office at ext. 4-3500 if you have any questions and one of the Procurement Specialists will be happy to assist you.